As I watched Notre Dame survive through five overtimes to beat Louisville last Saturday, I had this overwhelming sense of déjà vu. Here I was pulling for Louisville, knowing full well that the Irish were going to win the game. It was destiny. I’ve seen it before. It’s a well-ordained script. Not just the luck of the Irish, but also perhaps some divine intervention. At least, the Catholics believe. Spiritual awakenings are common in basketball at all levels, but at the college level it borders on the epiphany, where the devoted and frenzied fans drive it up a notch. 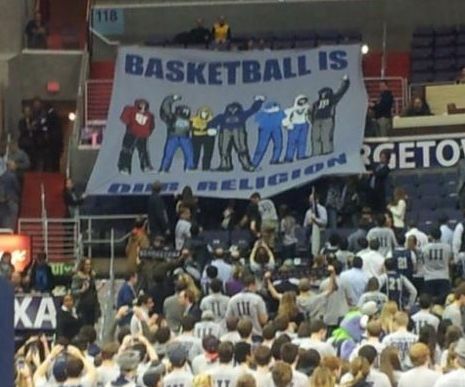 Note the sign from the Georgetown faithful in the photo above. Earlier this year, Villanova channeled higher power to knock off top-rated teams Louisville and Syracuse in succession, even though they’ve struggled through the year, losing 10 so far. I confess I draw my basketball compulsion from Catholic school. We only had one sport at little Holy Name of Jesus, the one we played in the gym/convocation center. We played on our lunch break and after school, and I followed the team religiously by bus all over western Kentucky, as a back-seat busser and aspiring sports writer. I was writing basketball game stories for the local paper when I was in high school, so I felt like a player. Our little Catholic school would compete far above its enrollment or weight class. Boys would live in the gym, firing up shots from all over. There were no 3-point shots back then, but the long jump shooters were the heroes. We might not be able to mix it up underneath with all the big boys, but we could shoot over them, with amazing regularity. That is what makes basketball such a great sport, the truly beautiful game. You don’t need to be the biggest and baddest, you just have to be the smartest, with the best-practiced skills. And above all, you have to play together. There’s no “me” in basketball, at least not at the winning level. Even Michael Jordan needed his Scottie Pippin and Steve Kerr. He couldn’t go it alone. That’s what I was thinking, back in 1983, when I recruited a couple of Hollywood, Fla., cops to fill out our three-on-three city league roster. I was the player-coach, and we were definitely challenged talent-wise, with a couple of shooters and one ball-handler, not much else. I took advantage of the opportunity to draft two African-American players – one 6-7 mobile big man and a quick, agile guard who handled and could shoot. We were three young editors/writers at the local Sun-Tatler, medium-sized guys with medium to slow speeds, so the infusion of talent may have rocked the boat a bit. My good friend Alan didn’t like it, and he told me so, but I really wanted to run and play at a higher level. And we did win more games than we would have otherwise. I probably over-coached and under-fathered in that situation, but I would get excited. I pushed the girls to beat the other team to the basket, ideally off steals. I taught the girls how to trap the ball and force bad shots, drawing on Kentucky’s successful 1-3-1 half-court zone press of the Joe B. Hall era. The idea was to take advantage of our speedy transition game. We managed to compete in every game enough girls showed up, winning the championship once. Sticky defense, good passing, fast break: That’s what I look for in a good basketball team, and why I think Indiana is poised to win the NCAA tournament in March, barring one of those five-overtime spiritual haymakers. Cody Zeller and Victor Olidipo are great players, and the Hoosiers also have good ball-handlers who defend, rebound and quickly push the ball down the court. They lead the nation in offense, but their offense is predicated on their defense. Duke, Gonzaga, Florida and Arizona can stake their claims, but the best teams are in the Big 10 this year – Indiana, Michigan, Michigan State, Ohio State, Wisconsin, Minnesota, Illinois, all with a legitimate chance to make noise in the tournament. We could see at least two Big 10 teams in the Final Four for the seventh time in history, most recently in 2005. But nothing is assured in college basketball, so don’t take my well-informed judgment to the bank. In particular, beware the little Catholic schools with the big crosses on their shoulders and no conscience with their shots. Besides Gonzaga, Georgetown, Marquette and Notre Dame are contenders, as are Creighton, Temple and Xavier. Anything can happen. But expect entertainment, excitement and a few miracles along the way. This entry was posted in Uncategorized and tagged basketball, Big 10, david byrne, fast break, half-court zone press, Indiana, NCAA tournament, Notre Dame, Running With the Glides by bymichael2012. Bookmark the permalink. Nothing about “saving” the ball? Heheh.